The President's daughter is pregnant! Zahra was spotted trying to conceal her growing baby bump at her Uncle's wedding which took place in Abuja on Friday. 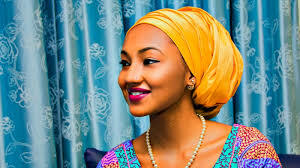 Zahra Buhari-Indimi, President Muhammadu Buhari's daughter, is expecting her first child with hubby, Ahmed Indimi. Zahra was spotted trying to conceal her growing baby bump at her Uncle's wedding which took place in Abuja, on Friday, March 30, 2018. Of course, she was glowing with motherly beauty but this is no surprise as Zahra has always been a looker.